Attention, Please was a collaborative installation and performance with artist, Sarah Storteboom. The piece was part of PHANTOM WING; a pre-demolition art project located at an old school in Calgary named King Edward. 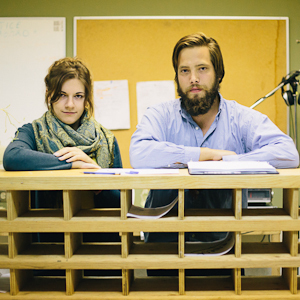 After re-establishing the school’s PA system, and re-routing it to an office space they built within the wing to be demolished, Sarah and Lowell acted as “Arts Administrators” during public viewing hours. The office provided a hub where viewers could sign in and ask questions, or just have a quiet break. Announcements were made by the artists regarding performance times, safety concerns, respecting the art work, lost and found items and summoning of misplaced friends and family. Throughout the exhibition, activities performed in the office were guided by the mandate of art ambassador, but maintained a superficial implication of authority.